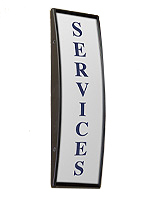 This Wall Sign Display Important Business Signs in Portrait or Landscape Orientation! 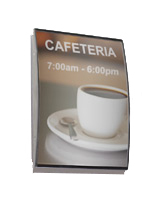 The Sign Holder Is Signage that Supplements Banners or Posters! This Wall Sign Is Shipped by the Hundreds! Black, anodized aluminum backer is strong. Lens is non-glare to prevent the sun from hindering poster views. Included is a suction cup so users can lift the lens for quick changeout of signage. Comes with 2-sided foam tape for hanging on flat surfaces. 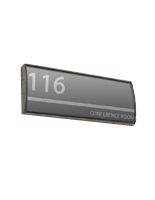 This wall sign is perfect for presenting room numbers within all sorts of venues. Educational facilities, offices and other buildings display the names of employees on office doors or way finding to the correct areas. 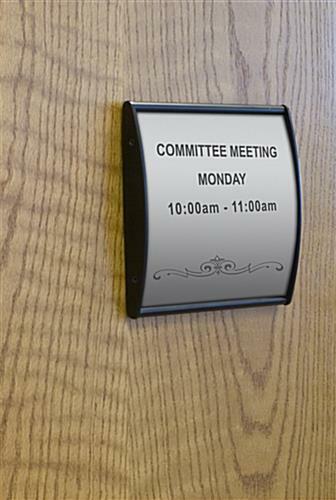 This wall sign features a sturdy backer that is aluminum with a black finish that complements most atmospheres. The aluminum metal fabrication ensures that the unit will last a long time. This wall sign is much stronger than comparable plastic units. The frame includes a non-glare lens, which stops lighting from negatively affecting the ability to see messages. This wall sign lens also stops dust and dirt from entering the unit. 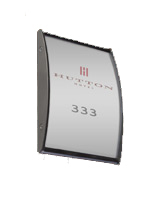 The interior sign display has a convex shape that is sure to generate some interest from customers. 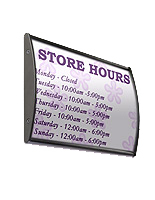 This wall sign allows users to install all of the vital information for customers to see. The business signage does not include images or artwork. This wall sign let users print out their custom messages with a standard printer. The unit comes with a suction cup for quickly removing the acrylic front. 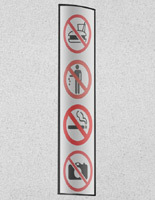 This signage holder, similar to a wall sign, includes the suction cup to take off the anti-reflective lens, and place new signage into the unit. 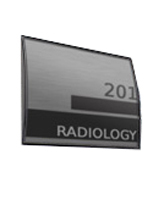 The name plate may be implemented to show emergency options, the name of the employee or complete directory listings. 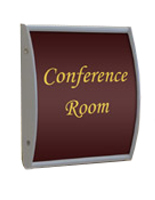 This wall sign comes with double sided foam tape for presenting the messages in either landscape or portrait format. This interior sign display, featured here, will update the overall appearance of the establishment for guests to enjoy!